You must be a member of the Zurich Changemakers Group to attend this activity. Would you like to join this group? 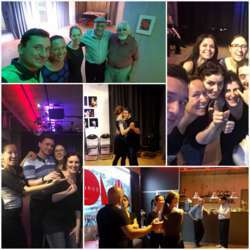 Our Tango Workshop from 16h30 to 18h is open to EVERYBODY, including People with any physical difficulty (alzheimer, parkinson, blindness or any other visible or non visible physical disease). The very special thing in this Workshop is that People with and People without Handicap will be dancing together. The Workshop will be guided by myself and with Esra Wyler. This will be an unique and unforgetable experience to ALL of us. MIMOS supports Integration for People with a Handicap. In this Course, People with and People without Handicap will be dancing together... this will be an unique and unforgetable experience.